RealStrat doesn't sound quite like a real Strat, but it's not far off. In the past week, two products have been added to our reviews database that are similar in concept and scope. 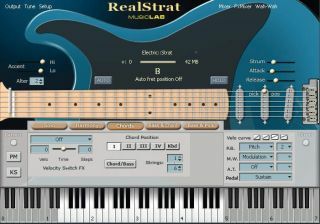 MusicLab's RealStrat and Rayzoon's Jamstix 2 aren't just virtual instruments, they're virtual instrumentalists (guitarist and drummer respectively). The fact that both are rated highly is sure to raise a few eyebrows. Are we really suggesting that you can replace seasoned players with a couple of bits of software? It's a tricky question to answer. Although neither RealStrat or Jamstix 2 sounds exactly like a real player, for many people - particularly songwriters who are looking to put together decent-sounding demos - the performances they can turn in will be more than good enough. However, this isn't to say that guitarists and drummers should hang up their axes and sticks and do something else. Real players will always give you things that virtual ones can't - that elusive human 'feel', for one - so it's hard to see them ever being replaced. But make no mistake: virtual players are here to stay and they're only going to get better in the future. I struggle to see this as anything other than a good thing, for they enable musicians who aren't multi-instrumentalists (that'll be most of us, then) to create complete arrangements on their own. You might argue that their emergence will have a social consequence - in the future, people will download a new plug-in rather than call up a guitar-playing friend - but I think this is a price worth paying. I don't have much time for the argument that if you use virtual players you can't call yourself a 'proper musician', either. If you've written a song, recorded the majority of the parts and sung the vocal, what's wrong with getting a little technological help with the guitars and drums? This software doesn't work by itself. It has to be told how to perform... just like a real player.